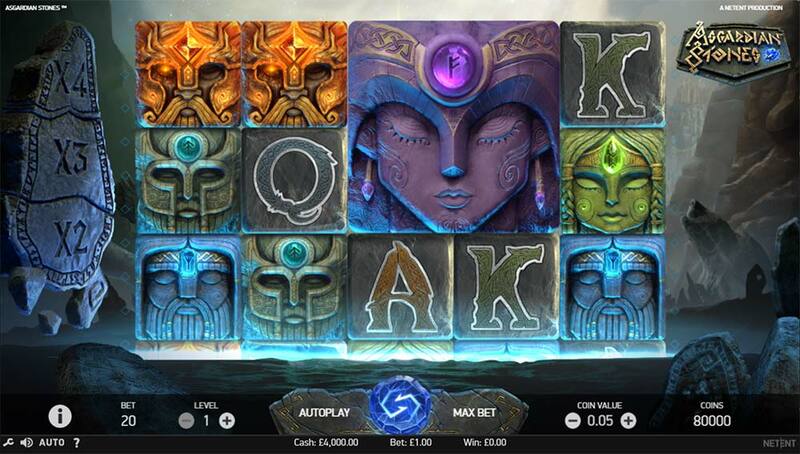 We Check out the Latest Avalanche/Gigantic Symbols Slot From NetEnt – Asgardian Stones! 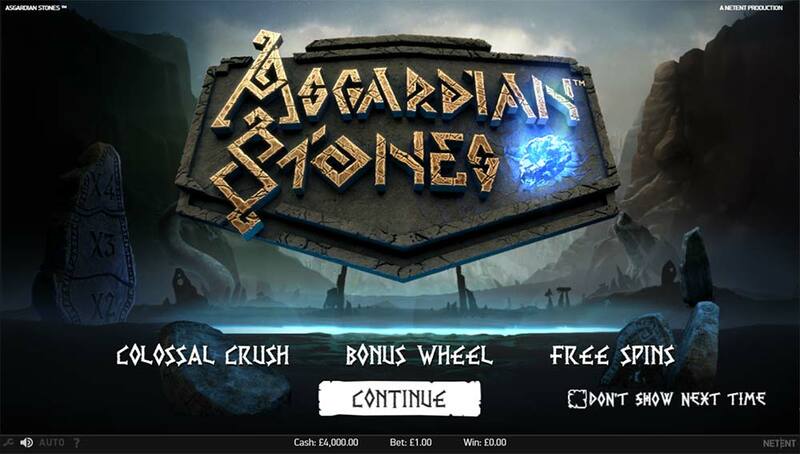 Energy Casino has just added a new Avalanche/Tumbling Reels style slot from NetEnt titled Asgardian Stones to their casino, this 20 payline machine is set in a Norse myth and legend setting with huge stone Norse God carvings forming the main highest paying symbols on the reels. Whilst obvious comparisons to this slot can be made to the classic Gonzo’s Quest in terms of mechanics, there are several subtle but interesting differences that make this slot well worth checking out. Firstly whilst there are multipliers shown to the left of the slot, these do not simply activate after scoring a winning combination, instead, the multipliers will only rise up to maximum 4x when the unique Colossal Crush Feature activates in succession. There is a selection of Gigantic symbols that range from a 2×2 size symbol up to the maximum 3×3 size, in the base game this does not include the Wild symbol, but in the free spins bonus round it’s possible to get Gigantic Wilds too. The way the main bonus round triggers is also unusual, there is a special 3×3 sized Bonus Wheel which can land full or partially on the reels, this contains a variety of coin prizes along with 5 free spins sections, when the bonus wheel lands fully in view its’s possible to get up to 15 free spins with 3 areas giving rewards from the wheel (see screenshots). You can check out all of the interesting gameplay features in Asgardian Stones in the video below. 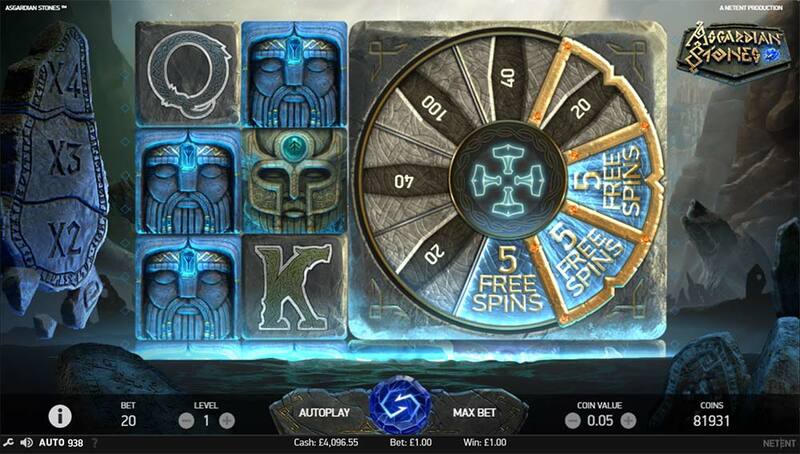 After a win in either the base game of free spins if a Gigantic Symbol appears on the reels and there are empty positions underneath it, the Colossal Crush feature activates and will crush any of the remaining symbols still in the way. This process continues until either there are no symbols left underneath or no empty on those reels., during these crushes, the multiplier value also rises up to a maximum of 4x if the Gigantic symbol crushes down to the bottom of the reels. Sound a bit confusing but seeing in action makes it quite simple to understand. 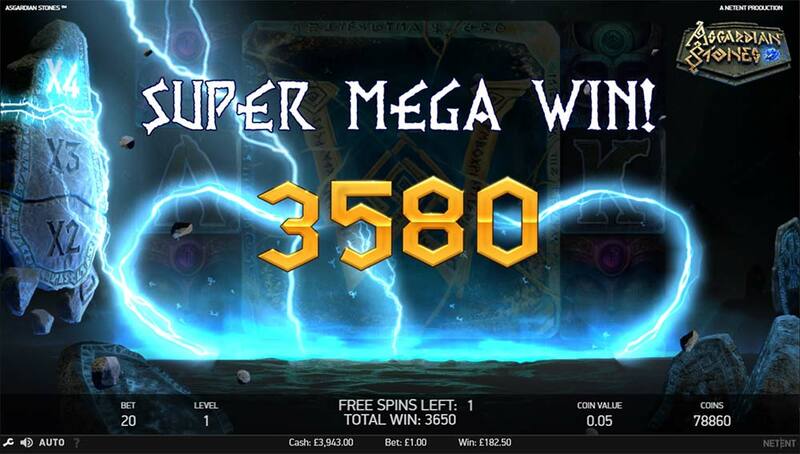 The free spins round is triggered from the special 3×3 sized Bonus Wheel, this can land on the reels either fully or partially to trigger, with the main difference being the number of winning sections of the wheel that are in view and hence the number of rewards you can win from the wheel. From the wheel, you can win anywhere from 1-3 rewards depending on where the bonus wheel has landed on the reels, this includes free spins rewards which are in the range of 5-15 free spins. 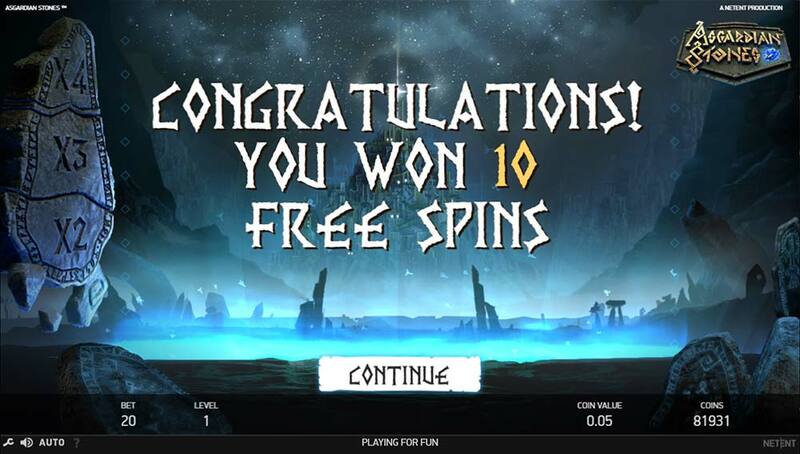 During the free spins, the same mechanics are at play as the base game but with the added extra that Gigantic Wilds are now present on the reels which makes it much easier to score wins and multipliers and in rare cases you can also re-trigger the bonus round if a bonus wheel lands during the free spins. We found Asgardian Stones to be one of the better slot releases from NetEnt in recent months, the graphics, animations, Multipliers and Colossal features all make for some exciting gameplay and with the bonus round introducing the Gigantic Wild symbols there is some very decent win potential. 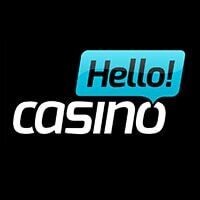 Whilst the Bonus Wheel can be annoying at times as you aren’t guaranteed to get any free spins, the potential from the bonus round is quite large, in our playtests we managed bonus round results in the range of 20x stake to well over 200x stake. 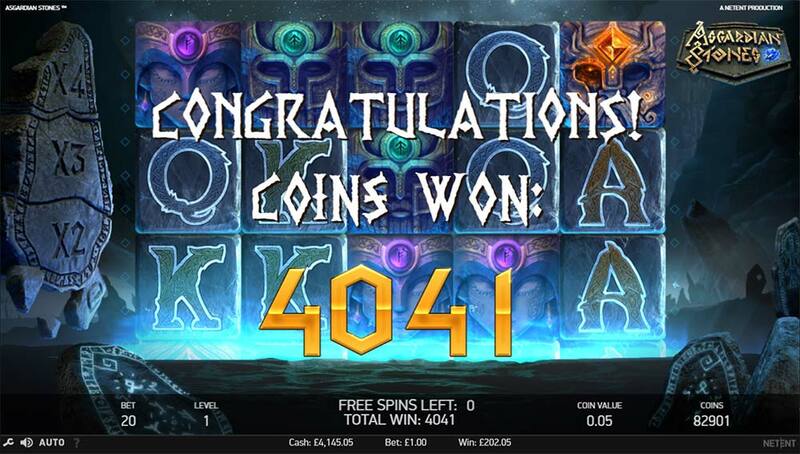 Probably a slot that will get missed by a lot of people with a frustration in not automatically triggering the free spins and the chance of just coin wins, but it felt reminiscent to the Lost Island slot (NetEnt) in terms of potential, in our opinion one to try!